At the same time, the Trudeau government is fighting to force the Trans Mountain pipeline expansion through B.C. over the provincial government’s objections and accusing B.C. of hurting the country’s economy. As a result, B.C. is involved in three court cases concerning environmental issues that involve the federal government. In two, the province is intervening in support of the federal government to argue in favour of a national carbon tax. In the third, B.C. is asking if it has the right to control what hazardous materials come across its borders, which could give it the ability to block the Trans Mountain pipeline expansion. The conflicting legal cases show a basic problem with the federal government’s climate change policies, Dogwood BC campaigner Sophie Harrison told The Tyee. The federal Greenhouse Gas Pollution Pricing Act comes into effect Monday. 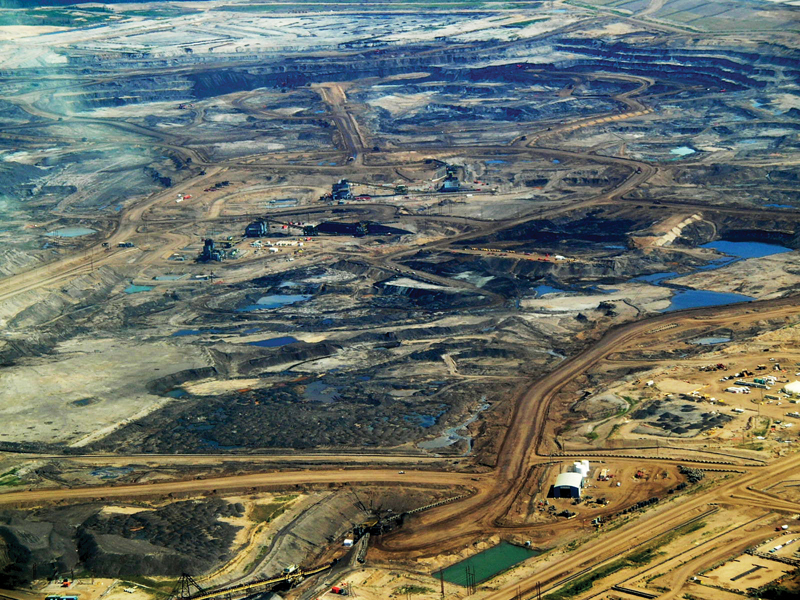 The tax will start at $10 per tonne of carbon emissions, gradually rising to $50. Will Trudeau Resign After Former AG’s Explosive Testimony? During a day where three concurrent Congressional hearings dominated the news cycle in the US, the testimony of Canada’s former Attorney General seemed to slip under the radar. But unlike Michael Cohen’s star turn in front of the House Oversight Committee, what former AG Jody Wilson-Raybould shared with lawmakers and the Canadian public actually might cause one head of state’s carefully constructed house of cards to come crashing down – just as campaign season is ramping up. With roughly eight months left until an election where Canadians will decide whether to stick with – or reject – the progressive agenda of PM Justin Trudeau, a widening corruption scandal is threatening to take down the prime minister’s entire government. Two weeks ago, journalists at the Globe and Mail blew the lid off a scandal involving Trudeau and his closest aides, where the prime minister appeared to pressure Wilson-Raybould, then the attorney general, into offering a DPA to a Quebec-based engineering firm – then fired her when she refused to obey his demands. And after weeks of radio silence, she shared her side of the story during a widely watched (in Canada) Congressional hearing Wednesday afternoon. 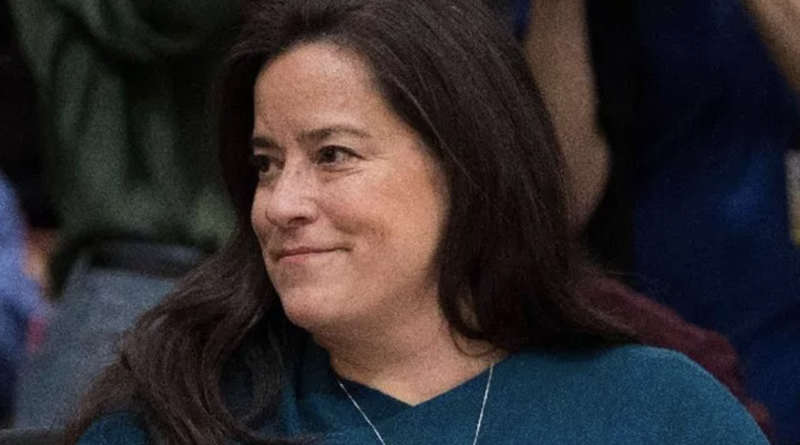 Answering questions posed by a conservative MP, Wilson-Raybould said she faced intense political pressure and veiled threats from at least 11 people involved in the government – either the PMO or the Privy Council Office – related to the SNC-Lavalin affair. She also said she was warned directly by Trudeau about the negative consequences should the company face prosecution, according to CBC. One close aide to Trudeau has already resigned over the scandal. Wilson-Raybould listed the people she had warned about “the inappropriate nature of these conversations” after they “hounded” her about the affair, including Trudeau, Finance Minister Bill Morneau, Clerk of the Privy Council Michael Wernick and the (now-fired) senior senior aide to the prime minister, Gerald Butts. On January 7th the Royal Canadian Mounted Police (RCMP) swept into a non-violent checkpoint set up by the Unist’ot’en and Gidimt’en clans of the Wet’suwet’en Nation. Fourteen people were violently arrested in the ambush by the militarized colonial forces. The camp was set up by hereditary leaders to defend the ancestral lands of the Unist’ot’en and other clans from the unwanted incursions of TransCanada and its Coastal Gaslink pipeline. 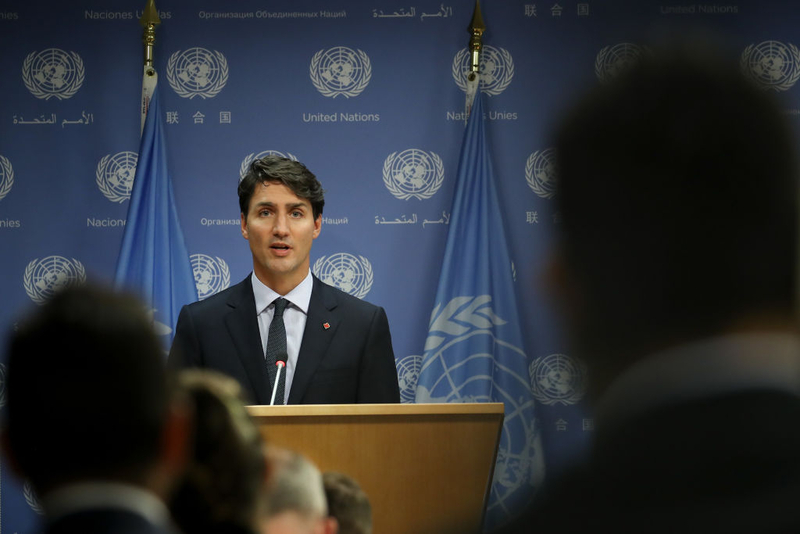 Following the incident Prime Minister Justin Trudeau had the temerity to extol the neoliberal scheme behind the incident as something that is good for the earth. In a speech to supporters he said: “We moved forward on the LNG Canada project, which is the largest private sector investment in Canada’s history, $40-billion, which is going to produce Canadian LNG that will supplant coal in Asia as a power source and do much for the environment.” After being pressed in a radio interview about the brutal raid Trudeau said of the arrests that it is “not an ideal situation, but at the same time, we’re also a country of the rule of law.” Apparently he does not consider Article 10 of the UN Declaration on the Rights of Indigenous Peoples to be law. It states: “Indigenous peoples shall not be forcibly removed from their land or territories.” It may be difficult for ordinary people to choke out hypocritical, ahistorical fallacies without missing a beat, but the Prime Minister has a gift for spouting empty platitudes that fly in the face of reality and he isn’t alone. There is something familiar about Trudeau’s lamentation on this situation as well as his appeal for the rule of law. This is because neoliberal leaders around the world have used similar justifications for the violence of the corporate state. All over the world, the forgotten man is rising up, reminding the ruling elite of his existence. Fed up with leaders catering to the whims of 0.05% of society, or instituting policies that impact their pocketbooks, the working folks of America, Italy, Brazil, and France are making sure their voices are heard in the political arena. This uncomfortable fact is sending shivers up and down their masters’ spines, including those in the Great White North. For so long, Canadians were passive and apathetic about how they were treated by their rulers. They just drowned their sorrows of excessive taxation and abuse of the public purse in a Tim Hortons double-double and a plate of poutine. That’s just the way it is, they cried. There’s nothing to do, they grieved. It is this level of arrogance that puts Trudeau and his minions out of touch with typical Canadians. But then Prime Minister Justin Trudeau happened. The trust fund baby is a man who continually talks down to those who are not like him. By encouraging young people to use “peoplekind,” openly wishing that Ottawa would embrace a Chinese-style government, and suggesting citizens with real concerns about Syrian migrants are racist, Trudeau has begun to light the populist spark from British Columbia to Newfoundland. The Prime Minister of Canada Justin Trudeau is planning to dramatically increase taxes on carbon emissions to combat climate change…he plans to set a national price on carbon emissions of $7.5 a ton rising to $37.50 by 2022! Similar tax hikes have caused massive upheaval in France where protesters are putting on yellow vests in solidarity and they’re hitting the streets. In this video Dan Dicks of Press For Truth speaks with G. Edward Griffin of Freedom Force International about the climate change scam that is being waged by elite globalists who seek to enslave everyone under their global umbrella. Canadian Prime Minister Justin Trudeau, it seems, adheres to the principle of globalism, according to which the world is borderless, and the idea of sovereign nation-states is both reactionary and obsolete. In this borderless world, the governing body is the unelected, untransparent, unaccountable and deeply corrupt United Nations and its agencies, which possess the authority to legislate international law that is then enforced by member states. The Global Compact for Safe, Orderly and Regular Migration is a document detailing the requirements for UN member-states to adopt as policy that amounts to unfettered global migration. Trudeau has bought into this UN agenda and has decided to impose it on the Canadian people without their prior knowledge or consent. The Global Compact requires the media outlets of member-states to adhere to the objectives and refrain from any critical discussions of these objectives that would be deemed as not “ethical” and against UN norms or standards consistent with the ideology of globalism. This helps to explain the Trudeau government’s generous handout to the Canadian media. In this light, the $600 million can be viewed as a form of secretive soft control and censorship, ensuring that the Canadian press abides by the requirements of the Global Compact. 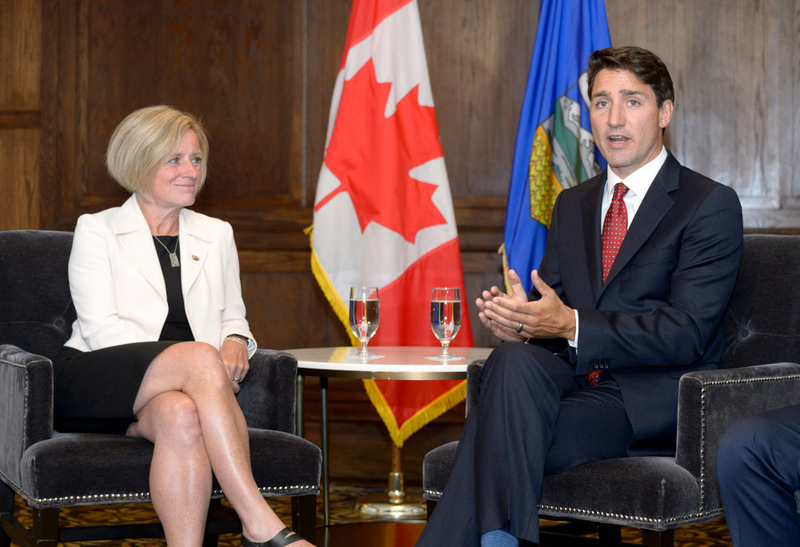 Alberta Premier Rachel Notley and Prime Minister Justin Trudeau are ignoring the law, economics and the environment in backing the Trans Mountain pipeline. Photo from trumpvstrudeau, Creative Commons licensed. 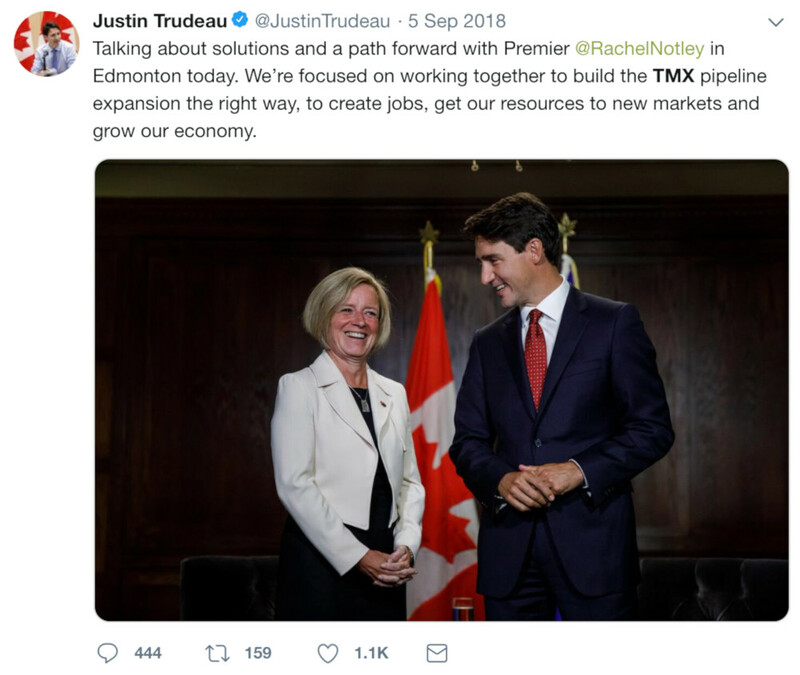 The debate about the Federal Court of Appeal decision that killed the approval for the Trans Mountain $7.4-billion pipeline expansion speaks volumes about the oily state of Canadian politics. 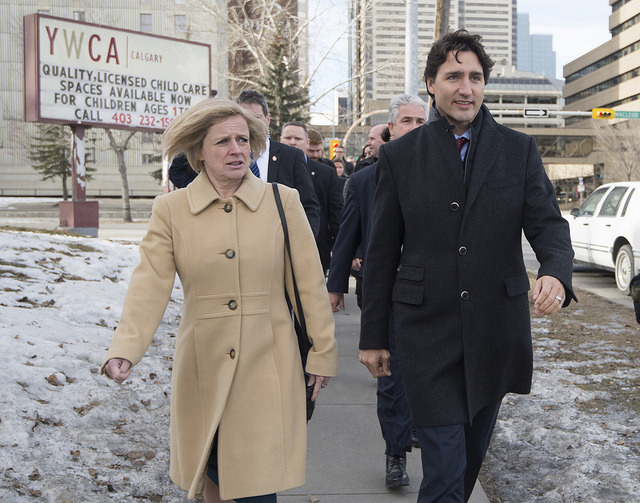 The leaders of Canada’s die-hard petro republics, Alberta’s Rachel Notley and Saskatchewan’s Scott Moe, predictably chaffed and frothed. Business types lamented that the courts had dealt another blow to Canada’s mining republic reputation by slowing down another noble megaproject promising jobs and prosperity — for China no less. 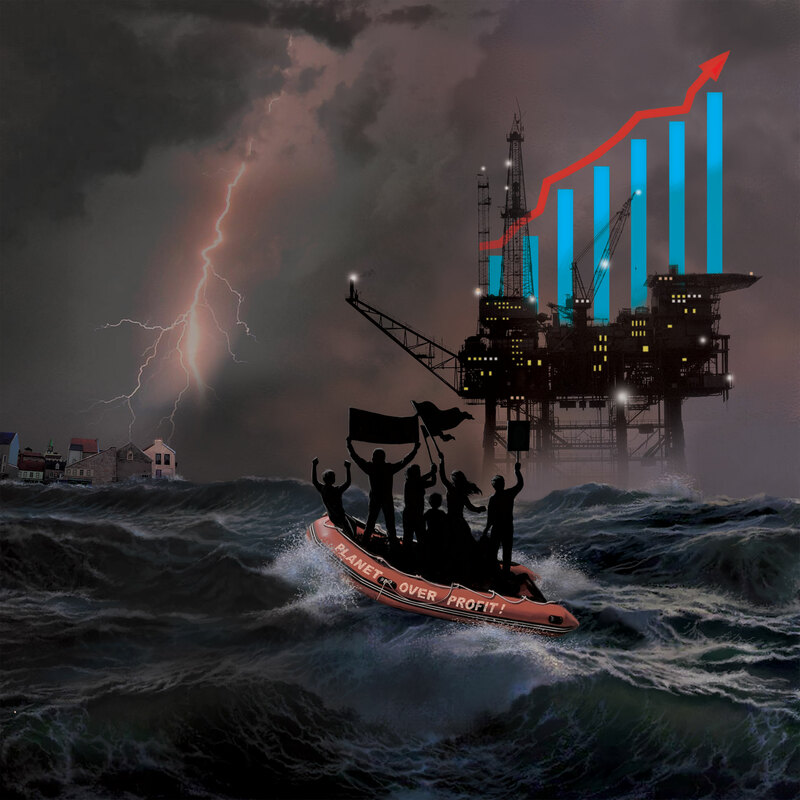 The power of oil to construct narratives that bear little or no relation to the truth is a global phenomenon and, in Canada, a new boreal specialty. You can’t find a more entitled political player than a petroleum exporter. 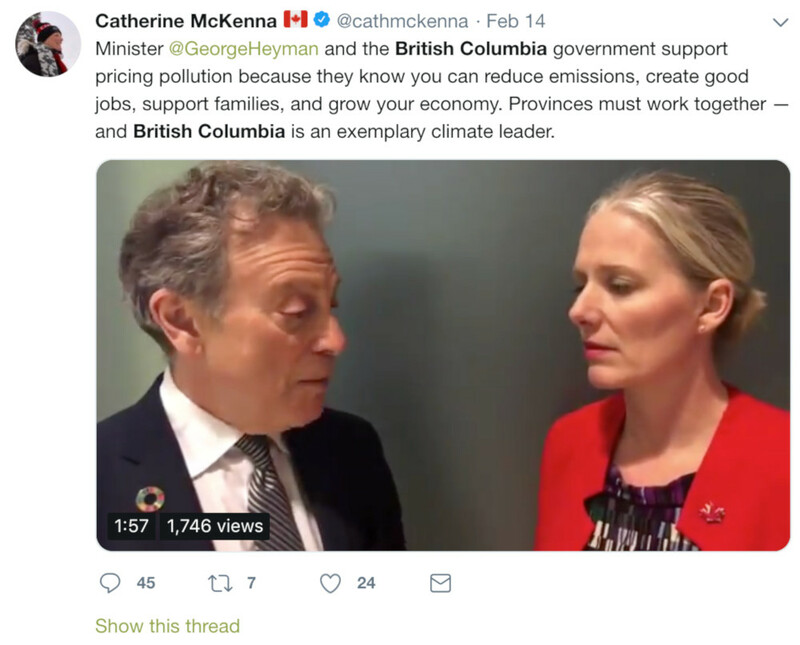 All in all, the media and Canadian politicians reduced the court decision to a dubious concession to pesky First Nations and environmentalists and another damned hurdle for “the national interest” and the pursuit of jobs. But that’s not the truth or the reality. Here are some of the important issues that concerned citizens should now be contemplating in the wake of the historic decision. Tomorrow’s G7, or rather G6+1 meeting, is shaping up to be one for the ages. As we reported previously, chancellor Merkel already was setting the ground for the Toronto showdown among the world’s top political leaders, vowing to challenge Donald Trump on virtually every issue, from trade to climate, and warning that the lack of room for compromise means leaders may fail to agree on a final statement, an unprecedented event at a summit of the world’s 7 most advanced nations. Then, earlier today, in comments made alongside Canada PM Justin Trudeau in Ottawa, French President Emmanuel Macron said that no head of state is “eternal” and that he stands ready to work with the six other Group of Seven members if U.S. wants to stand alone. “You say President Trump doesn’t care. Maybe. But none of us are eternal and our countries, the commitments taken, go beyond us. None of us who have been elected by the people can say ‘all prior commitments disappear.’ It’s just not true, there is a continuity in state affairs at the heart of international laws. Sometimes we’ve inherited some commitments that weren’t core to our beliefs, but we stuck to them, because that is how it works for nations. And that will be the case for the United States – like for every great democracy”, Macron said quoted by Bloomberg. The Liberals had won the 2015 federal election with a pledge to run annual shortfalls of no more than $10 billion over the first three years of their mandate, and to eliminate the deficit by 2019-20. The deficit for 2016-17, Trudeau’s first full fiscal year, was $17.8 Billion. The forecast for 2017-18 is $19.9 Billion, and for 2018-19, the forecast is $18.1 Billion. While austerity can come from fiscal necessity, it should not turn into a rigid ideology about deficits that sees any investment as bad spending. The government says deficits are economically beneficial, and compares deficits to loans taken out by entrepreneurs and business owners. But here’s the rub: in order to spend, the government must first raise money by taxing or borrowing (deficits). This deprives the private sector of money which would otherwise be available for businesses to borrow and invest in new production, thereby creating jobs and raising our standard of living. I immigrated to Canada in 1967, not quite fifty-one years ago. At the time I was young, naïve and did not know much. Well, I knew a little since I was caught up in 1960s America, then roiled with opposition to segregation and Jim Crow and to the US war of aggression in Southeast Asia. Americans did not call it that of course; for them it was the “Vietnam War”. I walked on the last day of the march from Selma to Montgomery, Alabama in 1965. We travelled in a train from Washington, DC to Montgomery and back, with the shades drawn, so crackers would not have good targets to shoot at. It was the year after Ku Klux Klansmen murdered Chaney, Goodman, and Schwerner in Mississippi. It was dangerous to be black in America, and it still is. It was dangerous too for naïve young whites to stick their nose into business that did not concern them. But of course when you are young, you don’t see the danger, or think that it could come looking for you. Death was still a rather abstract thing. Then we “graduated”, so to speak, to opposition to “the Vietnam War”. That was more personal because you had to decide whether—and I put this politely—you were going to fight in a war in which you did not believe. COMMENT: I think the danger for Canada is not Quebec leaving because they get 11 billion dollars a year given to them by the federal government, it is the provinces paying the bills that are more likely to leave, western Canada in general but especially Alberta which has been getting hosed. As you noted before resentment is what is produced by giving billions of mostly western Canadian dollars to eastern Canada each year. Now Trudeau is attacking the oil industry that pays the bills, the man is insane and destroying Canada. 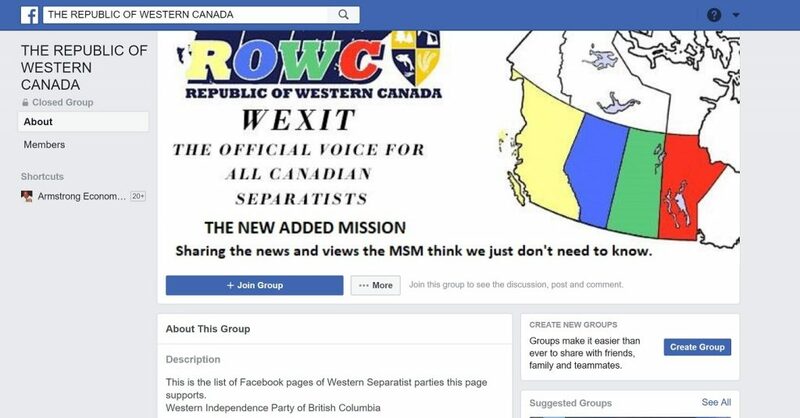 REPLY: I am fully aware that the Separatist movement is rising very rapidly in Canada and it is the West v East. Trudeau’s socialist agenda is again imposing the philosophy of class warfare upon the whole of Canada. 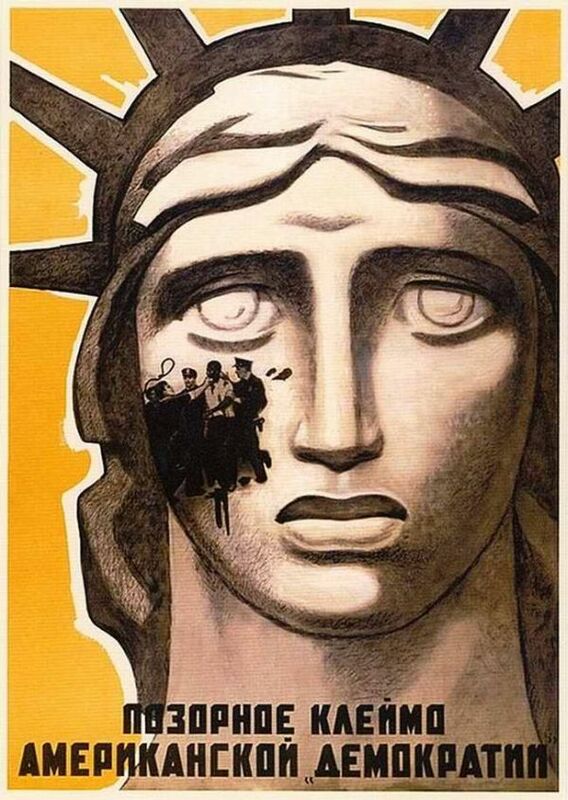 This only inspires uprising and discontent as we are seeing in Europe. The very same issues were behind the Trump Revolution. The media keeps desperately trying to overthrow Trump as president to save the socialist agenda in the USA. Understand that this is the death of socialism. As it declines as an economic philosophy, those who are diehard leftists will do whatever they can to take power back. The world is now at the mercy of a coalition of three of the most dangerous autocrats on the planet: Donald Trump, Benjamin Netanyahu and Saudi Arabia’s new absolute ruler Mohammad bin Salman a name that will become increasingly familiar as the months go by. These three ‘leaders’ are now collaborating in an incredibly reckless plan to permanently reshape the Middle East. The final outcome will unfold no matter what Canada does. But unless the Trudeau government gets a grip on reality Canada will be drawn into this potential catastrophe by virtue of foreign policy positions it has already taken. Geopolitics is getting incredibly complex and there is little evidence that the Liberal government has a clue how to navigate through the dangers. The problem is that despite all the hype about “being back” Canada’s foreign policy under Trudeau and Freeland is still characterized by cynicism and ill-considered trade-offs on files within the broad spectrum of foreign affairs – including investor rights agreements like NAFTA and the Trans Pacific Partnership. Obviously a certain amount of realpolitik is inevitable and even necessary to protect Canada’s interests. But even so it begs the question of how Canada’s interests are defined. How much of the store is Trudeau willing to give away to buy favour with the US on NAFTA, especially when it seems concessions like putting our troops on Russia’s border has gotten us nothing in return? With Trump and his redesigned US Empire, there is no quid pro quo. The embarrassing “me too” gang up on Russia is bad enough. The Canadian version of the US Magnitzky Act is a pathetic effort to please the US (EU allies in NATO are increasingly uneasy about Russophobia given their own particular national interests). And Putin can hurt Canada and Canadian businesses more than we can hurt Putin and his oligarchs – and he has promised to do so.